Not-A-Poll: Worst Opposition Leader Of The Last 45 Years: Grand Final! Oh yes, there was actually a book about these two! Welcome back to the final round of our exciting but brief quest to find this site's pick for worst opposition leader of the last 45 years. We started by splitting the field into two groups, those who at some stage had been PM and those who had not yet been PM. Tony Abbott cleaned up the former with an outright majority in round 1, while the latter was a closer contest. The Latham-Downer stoush showed why I run these things for a month. Downer led out of the blocks by a surprisingly large margin given Latham's primary vote lead from the first round. But after a while Latham started gradually catching up. After 23 days Latham took the lead, and his lead continued to grow; in the end it was close but not super-close (52.8% to Latham, about what John Howard beat him by in 2004). So it comes down to this. I stated the case for (or should that be against) Latham last time. Regarding Abbott, his credentials as a bad opposition leader are seriously dented by the fact that he won an election and won it big, but it's unclear how much credit we should give him for that. In tactical terms, he did steer the Coalition back to competitiveness by opposing Labor on emissions trading, and it might be that everything Labor did from there was self-inflicted as a result of internal tensions between a factional system and a self-styled presidential leader. Abbott opponents may also argue that it's not just about whether you win or lose but above all about how you play the game, and I'm not sure those who want to take that line need me to provide examples (or that I have time to list them all.) 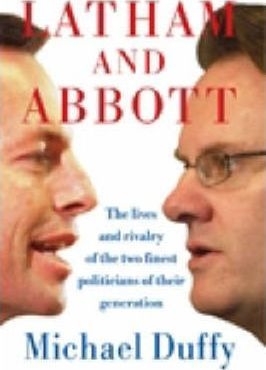 As with Latham, I suspect Abbott's post-OL performance taints his legacy as Opposition Leader, though in my view he was actually a much more harmless PM than he could have been. In comments, reader Carl adds another relevant criterion: that good or bad Opposition Leadership in a tactical sense is not only about whether you win, but also the extent to which your victory limits you. Voting is open in the sidebar now and continues til 6 pm 31 August. The deletion of these articles, some time since January 2017, was never requested by me and I was never informed of it. My request to TT, given that they were unwilling to publicly apologise for Ted Mead's garbage to my satisfaction (or publicly at all) was "remove the link to my site from the sidebar immediately and please cease linking to my site in future." Even if it resulted from a misinterpretation of my request as a request to remove all existing links to my site, numerous other old articles linking to this site are still up. You can see maps of the Garland vote and the 2PP swing over at The Tally Room. The Liberals did very well on 2PP swing on the West Coast, were smashed on King Island and the west end of the coast (Wynyard - Stanley area where fishing is important) and got small swings in Ulverstone and Devonport-Latrobe. Outlook: Your guess is probably as good as mine. I've finally found the time to write a detailed post about the prospects for the Longman by-election. 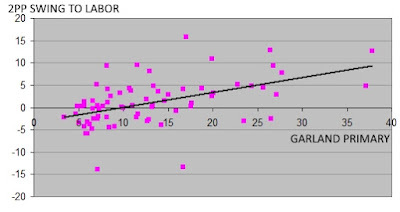 This won't be anywhere near as long as my Braddon guide but I think it is worth explaining why we are seeing Labor struggling in the polls, the betting and in commentary perceptions in this seat. (That said quite a few people think Labor will win Longman but lose Braddon instead.) 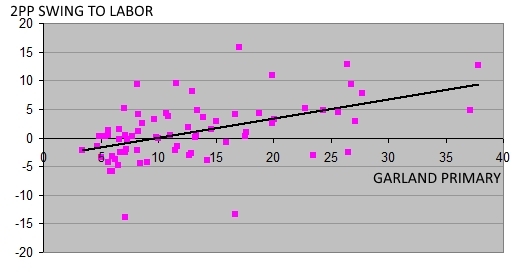 When I first wrote about these by-elections, I thought national polling gave Labor enough advantage to probably just hold Longman, but since then Labor's national position has declined. Labor may still win the seat, but their position is quite fragile. The accuracy of Australian seat polling has been an important topic lately, especially given the coming by-elections. By-elections are very difficult to forecast. Even after throwing whatever other data you like at them (national polling, government/opposition in power, personal vote effects, state party of government) they are less predictable than the same seats would be at a normal election. So it would be nice if seat polling would tell us what is going to happen in them. Unfortunately single-seat polling is very inaccurate. I discussed this in a recent piece called Is Seat Polling Utterly Useless?, where I showed that at the 2016 federal election, seat polling was a worse predictor of 2PP outcomes than even a naive model based on national polling and assumed uniform swing. The excellent article by Jackman and Mansillo showed that seat polling for primary votes was so bad that it was as if the polls had one sixth of their actual sample size. It doesn't seem that seat polls are useless predictively, but we certainly can't weight them very highly. Even psephologists have trouble with counting to big numbers sometimes. Like two. Normally I release a new post in this series every second Newspoll week, but two weeks ago on Newspoll Monday I had an inconvenient distraction. By the time I'd got through that and a couple of days of work my mind was so much elsewhere that I had forgotten it was time for another Poll Roundup. This is a piece concerning Twitter I've been meaning to write for some time, mainly so I can link to it and so others can link to it when explaining the concept of topicality to people determined to ignore it or else new to Twitter. Or who just don't know what "#politas" means. On Twitter, hashtags are used to to help people find material that is relevant to them. If a person is interested in something, they can use TweetDeck or other programs to set up a search for all tweets with a particular hashtag (a # followed by the subject matter), and thereby "follow" that hashtag.